This brand new work by James Jean features two interwoven landscapes stretching across fifteen accordion-style pages--the pages can be folded in a variety of ways to reveal different images within the landscapes. Features metallic foil-stamping on each page, a sturdy slipcase, and James Jean's preliminary sketches on the backside of each page. James Jean's commercial illustration career includes work for the New York Times, Atlantic Records, and Nike, as well as a series of award-winning covers for DC Comics and elaborate wallpaper installations and paintings for iconic fashion house Prada. Since 2007, Jean has focused his career on painting, book projects, and gallery exhibitions. He lives in Santa Monica, California. I had to return it it 3 times due to printing issues... covers misaligned, pages glued together, etc. I finally just took a refund. I loved the artwork, but it didn't seem like something I would really need to revisit, let alone deal with having to ship it back and forth to find a single decently printed copy. 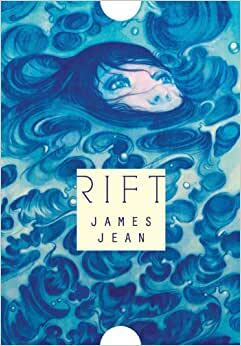 I really like James Jean so I may be biased in this review. Anyway this book is fairly impractical since it is small and it is accordian format - which makes for a very unique, albeit impractical presentation. The artwork is quite spectacular, and he has the preliminary sketch on the obverse of the very long (but short) panel. It is quite small, but if you have an interest in art (I am a painter/illustrator) then it is nice to have. Not really suitable for having out, or a coffee-table type book though. James Jean is one of the best artists in this era. A superb display of his artistry. This was a spectacular collection of art. The entire set is a folded up, flowing work. One side is colored, the other is a sketch copy. I purchased this as a gift for a friend and nearly kept it for myself. James Jean is a fantastic artist who does amazingly detailed work. This comes highly recommended. When purchasing this compilation, please take note of dimensions. It is shorter and thinner than most paperback books you'd find in your local store. Don't expect to get a large collaboration of paintings and illustrations that you can stand and look at from a distance. But that is really what's pretty neat about this "book". There's more than a handful of unique pieces of art that are compiled into these small hard covers. James Jean, living up to his reputation, doesn't disappoint with any of them. Yes, some of them and are slightly obscure, much of his artwork is very obscure, and not to be expected portraying vast innocence. These pieces betray neither his name, or the reputation of his individual pieces of art. If anything, it's encouraged me to continue keeping an eye on James.